We all know to brush our teeth each morning and night, but there’s a lot more that goes into maintaining a healthy mouth. In fact, you might even be performing some bad habits regularly — some of which you think are beneficial! If you want the cleanest mouth around, you can still right those wrong habits. To start, check out this list of common habits that might be causing harm to your teeth and gums. Of course you put a little elbow grease in when you brush your teeth; how else are you supposed to scrape off the grime growing on those pearly whites? Unfortunately, brushing too hard can actually damage your teeth and irritate your gums. Too much pressure might even lead to scratches and infections if you do it frequently. Plaque is surprisingly loose and soft, making its removal easier than you think. It’s only difficult to remove when it hardens to tartar, but you won’t be able to reach that tartar anyway; that’s a job better left to your dentist or hygienist. Besides, plaque on the surface of your teeth struggles to form with regular brushing and flossing. Instead of trying to power wash your teeth, gently massage your molars, canines, and bicuspids with the only the softest strokes of the softest toothbrush. You might be tempted to steal your partner’s toothbrush if you can’t find yours. After all, the two of you share food and drinks. On occasion, you might even kiss. All in all, it’s pretty gross to share your toothbrush with another person. It doesn’t seem that bad at first, but sharing your toothbrush with your spouse or partner can introduce a slew of germs your body simply isn’t prepared for. You might find yourself getting sick more often since the flu virus can stay on a surface for multiple hours. Toothbrushes also harbor pneumonia, HPV, and even bloodborne pathogens. The bacteria that causes cavities — otherwise known as streptococcus mutans — is also super contagious. Your partner might not even know if they have a cavity, thereby putting your mouth at risk. If your partner doesn’t have the cleanest mouth, your own dental hygiene may suffer accordingly. Did you know your toothbrush needs to be changed every three or four months? The American Dental Association (ADA) recommends you change your toothbrush at the start of each season. Not only do your toothbrushes accumulate germs over time, the bristles also tend to get frayed or broken with extended use (we’re looking at you, hard brushers). They might also start to look dirty or discolored. These older bristles won’t clean your teeth the way they should, promoting plaque and germ accumulation that can harm your teeth and gums. If you can’t remember the last time you changed your toothbrush, it’s time to get a new one. When you need to rush out the door, you might quickly run a toothbrush across your teeth and call it a morning. After all, a quick brushing for 30 seconds is better than not brushing at all, right? You’re not totally wrong. Brushing your teeth, no matter how long, is better than letting them rot. But you’re not really helping your teeth if you don’t do it for the recommended two minutes. In fact, the average American only brushes their teeth for 45 seconds, less than half the suggested amount of time. When you rush to brush, you’re leaving behind countless germs, plaque, and food that could wreak havoc on your mouth. On top of that, you need to give the fluoride in your toothpaste time to work its magic on your teeth. It needs longer than 30 seconds to improve your enamel. If you can’t get into the groove of brushing for so long, put on your favorite song to help pass the time. Most songs run between two and three minutes, the perfect amount of time to keep those pearly whites pearly. You can even try brushing to the beat of your favorite song for added fun. If you’re really on top of your oral care, you’re brushing after every meal; that’s great, but it might be causing more harm than good. It’s still recommended that you brush after a meal, but brushing too soon after you eat can be counterproductive. When we eat, the acidity from the food lingers in our mouths after we’re done. If you introduce abrasive toothbrushes immediately following a meal, you’re giving those acids better access to sensitive parts of your tooth. This will contribute to enamel erosion and lead to more sensitive teeth in the future. To prevent these acids from wearing down your teeth, wait at least 15 to 20 minutes before busting out the toothpaste. This will enable your saliva to neutralize and break down the acids in your mouth before they’re worked into the fine lines on your teeth. If you really cannot wait that long, try rinsing your mouth out with plenty of water before brushing. This will help expel some of the acid before you bring on the brushing. You might think you’re cleaning your gums when you brush your teeth. Most of us do. After all, the gums are attached, so when you’re going to town on your chompers, your gums are usually within firing range. Brushing your gums with ultra-soft bristles like those on the PeriClean toothbrush is a good alternative that will allow you to make sure you don’t neglect your gums by not brushing or hurt them by brushing too hard with a nylon toothbrush and causing gum recession. It’s okay to brush your teeth with pressure using the PeriClean ultra-soft rubber bristles, this will allow your teeth to get the cleaning they need while not damaging your gums or tooth enamel. While you might not need a tongue-scraper, remembering to brush your tongue will help prevent bad breath and any lingering bacteria in your mouth. The bristles of your toothbrush should do a fine job at loosening potentially harmful bacteria. For added germ expulsion, rinse with a mouthwash when you finish brushing. Soft bristles aren’t for babies; in fact, softer bristles are better for your teeth and gums than both medium- and hard-bristled toothbrushes. They bend more easily, making them great for the gum line. They’re less abrasive than hard bristles so they won’t damage your teeth. For people with weakened enamel or sensitive teeth, ultra-soft bristle toothbrushes are the best option around. Harder bristles can even weaken enamel and contribute to a receding gum line. Many toothbrush providers have even begun to phase out making hard toothbrushes since they offer few — if any — benefits to brushing. In fact, you might be using the wrong toothbrush altogether. There is a right and a wrong toothbrush, but it isn’t so cut and dry. While dentists still give out free manual toothbrushes, they’re not always the best option. And choosing a medium or hard-bristle toothbrush can make for an extremely uncomfortable brushing experience. Meanwhile, commercials debut the newest technology for electric toothbrushes practically every other day. These electric options are great for people with tougher gums or people who have difficulty moving their arms to perform the right brushing techniques. However, electric toothbrushes with rotating or vibrating heads can still be harmful to those with sensitive gum lines or weakened enamel. Once you choose whether or not you want an electric brush or a manual toothbrush, think about the pros and cons associated with each one. 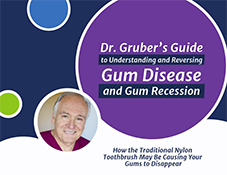 If you prefer manual toothbrushes, there are great options to help stop the recession of your gum line and ensure the healthiest mouth. Brands like PeriClean don’t use harsh nylon brushes, instead opting for ultra-soft, non-latex rubber bristles that help prevent further damage while still keeping your mouth clean and fresh. Leaving your brush on the counter. Storing it in a travel container. Putting it in the holder upside-down. These are all ways you’re promoting the accumulation of germs and mold on your toothbrush. Toothbrushes should only ever be stored in an upright position in the open air. This allows the bristles to dry properly before you use it the next time. Don’t leave it on the counter where the liquid puddles around your toothbrush. And don’t store it in a travel container or other enclosed space: using a storage container will lock in the moisture from the toothbrush causing all sorts of nasty germs and fungi to grow in the damp, enclosed environment. Avoid these problems by getting a simple stylish cup or toothbrush holder to store your toothbrushes. In the event you’re living with someone else or have a family of toothbrushes cluttering your counter, ensure your toothbrush holder has separate holes to keep the bristle heads from touching each other. Keep them away from the toilet (and always flush with the lid closed) and any open windows to ensure no extra bacteria gets on your brush. After all, this is the tool you put into your mouth again and again. There’s an old adage that running the same track every day will make one half of your body stronger than the other. To combat this, you should try running in the opposite direction, or better yet, change up your run altogether. Need another example? Your partner won’t like going to the same restaurant each night for dinner, even if the food is really good. Similarly, your teeth need some variety even if you avoid the above pitfalls. When you brush your teeth the same old way, you’re only cleaning the same old spots. This is great for those few locations that get a good scrubbing, but the other neglected parts of your mouth are slowly accumulating more and more bacteria. It will feel weird since you’re so ensconced in habit, but your mouth will feel cleaner if you brush in a different way once in a while. It can also have the added bonus of making your teeth brushing routine a little more fun. Try experimenting with your brushing pattern each day and track your mouth’s progress. Are your teeth looking whiter? Did you finally get that piece of pepper out of your teeth? You might be surprised. 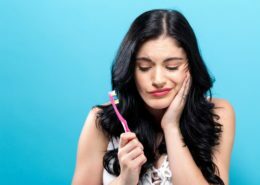 Are your brushing habits harming your teeth and gums? The answer is probably yes, especially if you’re sticking to the above bad habits. Don’t beat yourself up though; taking the time to recognize your bad habits is the first step to improving your oral and dental health. Sadly, one in four adults in the U.S. suffer from untreated tooth decay. Luckily, there are a few ways to change your habits for the better. If you’re struggling to improve your oral health, don’t hesitate to talk to your local dentist or other dental professional. Braces are a rite of passage for many adolescents, yet can be a contributing factor to gingivitis in children and adolescents. 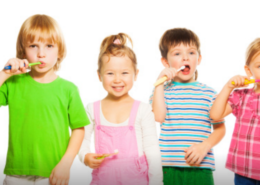 Gingivitis, which can be a precursor to gum disease, is found in 50 percent of all children. While orthodontic wires and brackets can help straighten crooked smiles, they can also contribute to the development of this early stage of gum disease. Caused by a buildup of plaque on teeth and gums, gingivitis is prevalent in those undergoing orthodontic treatment because it can be difficult to clean around braces, where food and plaque can accumulate. Because orthodontics is an important investment in future dental health, it’s important to take diligent care of teeth and gums throughout treatment. The following five strategies can help ensure everyday dental health while wearing braces. Tooth enamel and gum tissue are particularly vulnerable during orthodontic treatment. A hard-bristled toothbrush can cause receding gums, as well as damage orthodontic appliances. The soft, compact PeriClean with its softer, longer-lasting rubber bristles is ideal for removing food and plaque while protecting fragile teeth and gums. Traditional up and down brushing techniques can loosen brackets. While wearing braces, it’s important to place your brush at an angle of 45-degrees against the gums. 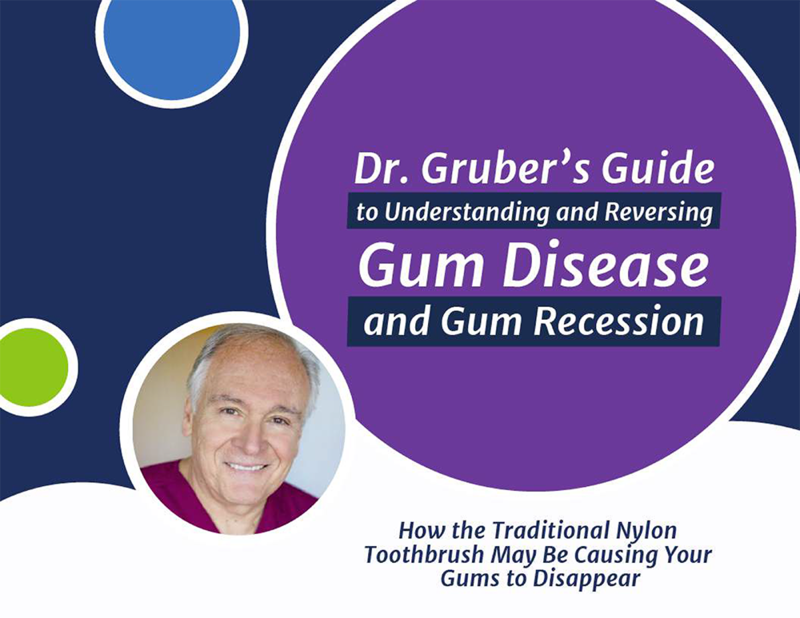 Gently brush along the gum line where the gums and teeth meet, using a circular motion with each tooth. 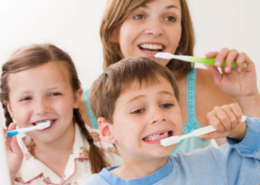 You will want to devote about 10 seconds brushing each tooth. Carefully brush the braces and around the brackets and wires so that the bristles spread into gaps between the wire and the tooth. Don’t forget to brush both the inside and outside surfaces of each tooth. Because you’re at a higher risk of developing tooth decay during orthodontic treatment, you will want the protection of fluoride products. This includes brushing with a fluoride toothpaste at least two times per day. A fluoride rinse can offer additional protection. If normal brushing is not sufficient at removing food particles from your teeth, your orthodontist may recommend a tiny cylindrical, interdental brush that can scrub between teeth where periodontal and tooth decay problems often begin. This can be used in conjunction with a floss threader which can make it easier to floss between teeth. Dry mouth is a common side effect of wearing braces. With braces taking up more space in the mouth, the result can be less saliva and an ongoing feeling of dryness. And with a dry mouth comes the increased risk of gingivitis. It’s important to stay well hydrated throughout orthodontic treatment. There are also products on the market that can help combat dry mouth syndrome to increase the amount of saliva being produced in your mouth. Does PeriClean Work between the teeth? Does a standard toothbrush work between the teeth? Does PeriClean work between the teeth? Find out in this dental health video. BRUSH SMARTER, NOT HARDER with PeriClean. https://periclean.com/wp-content/uploads/2017/06/maxresdefault-2.jpg 720 1280 Michael https://periclean.com/wp-content/uploads/2018/09/periclean-logo.png Michael2017-07-03 10:00:472017-06-20 14:42:09Does PeriClean Work between the teeth? Did you know that both your tooth enamel and gums are extremely thin? Tooth enamel is actually about the thickness of an egg shell, while gums are merely paper-thin! Due to the fragility that this creates, brushing too hard can break down tooth enamel and wear away gums. If you’ve experienced sensitive teeth, it could very well be due to gum recession, which can lead to bone loss and sensitivity. However, there is a way you can help prevent this! Brushing with the ultra-soft PeriClean reduces the chances of damage from vigorous brushing, thus protecting teeth and gums.